2011 in Review: Calling All Fashionistas! Color Red for Clothing (Sept-11)2: Who doesn’t love a vampy pair of red pumps? Or a great crimson-colored bag? Though it appears that consumers crave red in small doses: the Red Jeans/Pants trend (Jun-11) came in at #22 on this list (of 27). One-Piece Swimsuits (Jul-11): Maybe a monokini qualifies here? At any rate, it’s nice to see a little modesty on this list. Denim Cutoff Shorts (Jun-11): Daisy Duke called…a lot of consumers are still ripping off this trend [literally]. Ankle Boots (Sept-11): The vertically challenged cousin of the classic knee-high stomper, these boots work well with skirts, crops, dress pants, and denim, making them a versatile option for trendy girls on a budget. UGG® Boots (Jan-11): Try wearing these in the middle of winter. You’ll convert. Pajama Jeans® (Mar-11): You. Have. Got. To. Be. Kidding. Me. Pale Denim (Feb-11): While it may be a more relaxed and a less figure-forgiving than its dark denim counterpart, this was a relatively safe trend that a lot of consumers seemed to try. Plaid Fashion Trend (Dec-11): For the non-lumberjack look, try pairing a plaid shirt with a statement piece of jewelry. Perfection. Sheer Hosiery/Pantyhose (Aug-11): If it’s good enough for Duchess Kate and her sister Pippa, it’s good enough for us gals stateside. Clutch Handbags (Jul-11): When you can store just about anything on a smartphone, who needs to haul around a big handbag anymore? [OK, I do…but Clutches can come in handy]. – Griege Nail Polish (Jan-11): Another mash-up (Grey + Beige), which consumers found more bleak than chic. – Colorblocking Fashion Trend (May-11): Perhaps because it goes against what Garanimals taught the masses? It appears, though, that this trend is sticking around for 2012. This all is, of course, according to the What’s Hot/What’s Not section of our monthly Consumer Intentions & Actions® survey1. Each month, more than 8,000 respondents have the opportunity to rate a list of trends, personalities, events, etc. as “hot” or “not”; the items we ask about are based on input from our respondents from the previous month’s survey as well as a variety of current trending topics. And, for more information on this data, please contact BIGinsight™. 1 Hottest Trends for 2011 are limited to the 145 trends, personalities, events, etc. that were included in one of the 12 2011 Consumer Intentions & Actions® Surveys. Looking for Ryan Gosling, Charlie Sheen, Pippa Middleton, Keurig Coffee Makers, Occupy Wall Street, or Groupon? We got ‘em. Sorry about your luck on George Clooney, Zooey Deschanel, beach vacations, any of the Real Housewives, or Sperry Topsiders; they just didn’t make the our cut this year. 2 The month/year each item was asked is denoted in parenthesis (MMM-YY). While our previous post confirmed that Betty White was the most famous face of the year, we thought it’d be fun to dive a little deeper into the data to find out – among the 35 celebrities and personalities we asked about this year – who lands at the top of the “In” Crowd list for 2011. Let’s first cover 2011’s Top 5, and then we’ll attempt to answer some burning questions about some of the most talked about people of the year. Betty White (Feb-11)2: Please…who doesn’t love Betty? Jennifer Lopez (May-11): The American Idol beauty has been around the block, but she seems to be all the better off for it…diva-in-training Lady Gaga (Mar-11) peaked at #10 this year. Beyoncé (Jul-11): Even pre-baby bump, Beyoncé was a hit…but that seems to come with the territory when you are recognized by a one-name moniker. Reese Witherspoon (Apr-11): While respondents weren’t quite so receptive to Water for Elephants, they still really responded to Reese. Girl also got hitched this year…and who doesn’t love a happily ever after? Anne Hathaway (Mar-11): Recall that Anne was the more successful of the OSCAR® hosts this year. (Co-host James Franco (Mar-11) landed at #27 on this list, out of the 35 contenders). Q: When it comes to Pippa Middleton and Kim Kardashian, who has the best…um…well…you know? A: Pippa (#14, Jun-11), who nearly stole the show at the Royal Wedding, is the fanny favorite over Kim K. (#16, Aug-11). Interestingly, the post-“wedding” Kardashian family isn’t fairing so well with consumers (#30, Dec-11). Q: Aren’t there any guys on this list? A: Two and A Half Men newbie [and pre-split-from-Demi] Ashton Kutcher (Sept-11) was the highest ranking male on the “In” Crowd list at #7. But he faced some tough competition from the Muppets (#6, Nov-11), and Alvin & the Chipmunks (Dec-11) were HOT on his tail. A: Justin Bieber (Dec-11) was actually the next highest ranking male to make it in the “In” Crowd this year (at #13). The Boy with the Amazing Hair [the sarcasm should be palpable now] bested several of Hollywood’s hottest hunks: Ryan Reynolds (#18, Jun-11), Matt Damon (#19, Jan-11), Tom Cruise (#25, Dec-11), Bradley Cooper (#26, May-11), and Ryan Gosling (#28, Nov-11…please see Crazy, Stupid, Love. for my rebuttal on his low ranking). Do you have a suggestion for the 2012 What’s Hot/What’s Not list or see anything surprising in this list? Please leave a comment below. Grab your popcorn…it’s showtime for the year’s Top Movies, as we continue our year-end review of our What’s Hot/What’s Not selection (courtesy of our monthly Consumer Intentions & Actions® survey1). As you already know, we ask respondents to rate a list of trends, personalities, events, etc. as “hot” or “not”; the items we ask about are based on input from our respondents from the previous month’s survey as well as a variety of current trending topics. Interestingly, it doesn’t seem that moviegoers were eager to declare their allegiance to Team Edward Robert Pattinson, at least according to our Adults 18+ [read: non-tweens]. His two major outings for 2011, Twilight: Breaking Dawn (Nov-11) and Water for Elephants (Apr-11), landed at the bottom of our list. 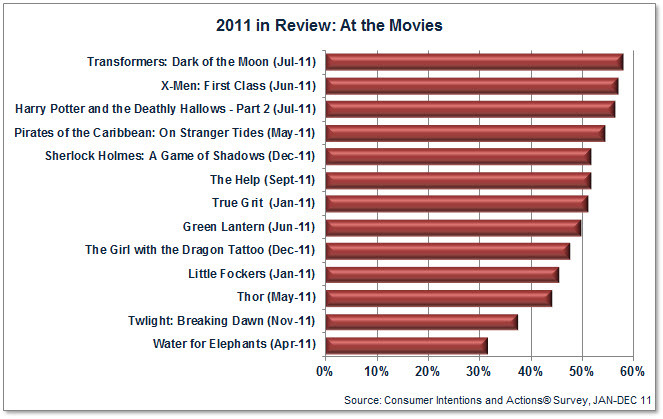 Now does this mean that consumers thought that these were the worst movies for 2011? Absolutely not (and box office results dispute this…as well as yours truly). But, among the movies we surveyed, our lower ranking ones were simply less anticipated than the likes of Transformers, X-Men, and the gang from Hogwarts. Be sure to click the chart below for the full ranking of our 2011 films. And, stay tuned…in a few days, we will also be releasing our list of Top Celebrities/Personalities for 2011.